Susan Scelzi has been active in the dog world since 1982. She & her Rhodesian Ridgebacks have competed in & earned many titles in obedience, agility, rally obedience & lure coursing. She is a certified Canine Good Citizen examiner for the American Kennel Club. She is a member of APDT (Association of Pet Dog Trainers) and is an active member of several dog clubs. She has been an instructor since 1992 teaching all levels of obedience from Puppy Kindergarten to the advanced competition classes. Most recently she has achieved her goal to be a CNWI a Certified Nose Work Instructor for the National Association of Canine Scent Work (NACSW). Annette Alfieri has been training and competing in obedience and agility for the last ten years and has recently started competing in conformation. Gail S. O’Connell has been active in conformation since 1970 under the kennel name “Talocon”. She has personally bred, trained, and finished 24 breed Champions, including Speciality Winners. She has bred, trained and handled a top-winning Champion Father/Son Brace to 17 Best in Shows and was undefeated in the Working Group. She is the breeder and co-owner of numerous obedience titlests,1 TDX and several TDI’s along with various agility titled dogs. 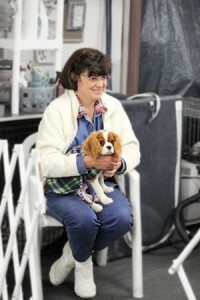 She has been a judge for many AKC-sanctioned conformation and Junior Showmanship events. Currently she is an active member of three breed specific and 2 all breed clubs.